The Woman’s Weekly of 16 October 1943 fills in some details omitted by the Argus of 2 October 1943. The first and most obvious point was that Ethel was better looking than older brother George. Ethel was the youngest of the seven Formby (really Booth) children, and she was interviewed while playing the Melbourne Tivoli circuit. She had just spend a year in New Zealand with her husband, John Gibson, who flew fighters with the RAF. She met Johnny when she was 18 years old and married him after a five-day courtship. “He was so persistent”. While in Australia, Ethel hoped to meet former members of squadron 457, in which her husband had been a flight commander. 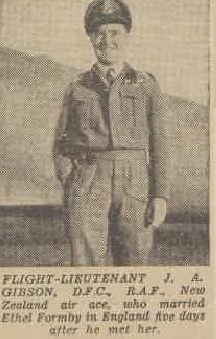 Johnnie had to bail out of his aircraft on three occasions during his war service, and once landed his plane on an unexploded German bomb. (It went off, destroying his fighter, about 20 minutes after he was out of it). Ethel lost a ukulele during the Blitz, along with everything she had in the house. The lost uke was named Bertha (the one she had taken to boarding school), but happily her other ukes, Matilda and Ermyntrude were still ok.
She started on the stage as a dancer, but took up ukulele performances because it was much easier than dancing. She played the same sorts of songs as her older brother, only using her Lancashire accent for these performances. In a sleazy back-street novelty shop in Melbourne, Australia, there was a skinny little clerk, a solemn chap, with little to say to anybody, slouched over the counter reading sea tales when there were no customers. They sold ukeleles, among other odds and ends. The lad had to learn to tune them. He picked up a few chords, got interested and began whamming away in the back room. His had been a rather meagre life. Music stirred and agitated him. He longed for wider horizons. One day the youth packed his sea stories, a pair of dungarees and his ukelele in a duffle bag and went to sea. He rode ketches between Melbourne and Australia [sic]. It was hard, dirty work, but he found time to sit on the forward hatch and bring up the Southern Cross with his ukelele improvisations. A hurricane in the middle of the night set the ketch on her beam ends. The lad jerked loose his pajama string and tied the ukelele around his neck with it. Naked, he dived overboard and fought the boiling sea for hours. Time and again he was sinking, but the uke provided buoyancy to help him keep afloat. At daybreak, Harry Bridges, dressed only in a pajama string and uke, was thrust ashore by a last sullen push of the storm. It seemed quaint that a wet, naked little man with a ukelele, even in this elemental Wagnerian setting, should get a nod from Destiny. But he did. He clothed himself, first with fresh dungarees, and then with power. At 36, he stirs left wing labor ferment, and angry and bedeveliped ship owners will tell you that’s nothing trivial. One never knows what a ukelele might do for a person. Whatever would Flo have said about that — all he had were Cliff Edwards and Ruth Etting! The Argus newspaper of Melbourne, Australia, was finally permitted to reveal on the front page (27 of September, 1940) that the ukulele was played as a ship, carrying Australian trainee airmen, left for Canada some months before. After the young men were safely in Canada, it could be reported that the tallest of the trainees was 6 feet 5.5 inches tall, and one of them was a leading long distance runner. Half an hour before the liner pulled out from an Australian port, an airman with a ukulele accompanied a group singing “Wish me luck.” “Oh, Johnnie!” and “Till the lights of London shine again.” As the grey ship swung down the stream the notes of “Waltzing Matilda” came back to the little group on the pier. So, you may know what tunes he played on the ukulele, but you may not know the Quay (sorry). Petite, blonde Ethel Formby, sister of the famous George, arrived in Melbourne from Sydney yesterday to fulfil an engagement with Tivoli Theatres, opening on October 11 in Folies Bergeres. Later she expects to tour Australia entertaining servicemen. Had not Ethel followed in [George’s] footsteps, she could have made a name for herself by her own good looks and bright personality. She is little more than 5ft in height, with hazel eyes and fair complexion. Taking up the ukulele, one of the many instruments in the Formby house, Ethel taught herself to play and sing, and it wasn’t long before she began to get engagements in music halls and revues, singing Lancashire dialect songs to banjo accompaniment. In private life, Ethel is Mrs J. A. Gibson, wife of Battle of Britain pilot, Flt-Lt Gibson, DFC, a New Zealander serving with the RAF, whom she met and married in England a month after the war broke out.